Aswan, the most southerly Egyptian resort city, and a popular holiday destination, has more of an African ambiance than most Egyptian cities, due to its numerous Nubian inhabitants, who bring in their own interesting culture and customs. Although every bit as touristy as Luxor, Aswan and its inhabitants are generally far more laid-back and travellers often report how friendly they are. A picturesque city, Aswan's attraction as a holiday destination lies not so much in its historical sites, as in the peacefulness of a felucca cruise at sunset, a visit to the colourful market (Sharia el-Souq), or dinner at one of the floating restaurants on the Nile. 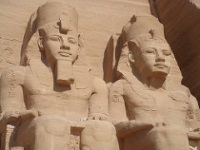 Aswan is a perfect base from which to visit the magnificent Sun Temple of Ramses II, Abu Simbel, which is one of the most famous attractions in Egypt. There is plenty of shopping to be done in the various markets while on holiday in Aswan, from shoes and clothes to jewellery and leather. Sharia as-Souq is a popular market in Aswan where the touts have a reputation of being less pushy than in most of Egypt. Haggling is the best way to get the cheapest price. It is wise to be cautious when buying jewellery as many fake pieces can be mistaken as authentic. There is endless appeal in dining on the edge of the Nile. Aswan fully capitalises on this with numerous riverfront restaurants and even floating restaurants. There is traditional Egyptian fare available of course (and Egyptian fare tends to be cheap and plentiful) but also a lot of international cuisine. The 1902 Restaurant, in the Old Cataract Hotel, is reminiscent of an ancient tomb and serves French cuisine and local fish. It played host to such dignitaries as Winston Churchill and King Edward VII's brother on its opening night and is still one of the top restaurants in Aswan. Aswan's nightlife can't compete with that found in Cairo or Luxor but there is plenty of fun on offer nonetheless. Night shows are popular in Aswan and the dramatic light and sound shows are a good introduction to Egyptian folklore and history. There are regular live music performances on offer. Night cruises on the Nile are also a lovely after-dark activity. There are many more conventional nightlife options though, with bars and pubs and even the odd disco to investigate. A felucca (traditional sailboat) trip down the Nile is one of the best ways to see Aswan and surrounds while on holiday. The Nubian village and remains of ancient Memphis on Elephantine Island are well worth a visit, as are the Ruins of Abu, Aswan's most ancient settlement. 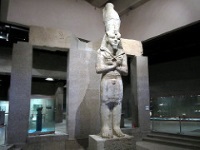 Visitors can delve deeper into history at the Nubian Museum. The far side of the Nile is desert as far as the eye can see and this is the perfect setting for a camel trek. 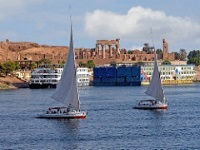 Aswan can become quite touristy and overcrowded during peak season.